An average sized tire-house removes 2,000 tires from landfill space. An efficient passive-solar house design also saves a lot of energy used for heating and cooling, additionally reducing carbon footprint of building a home. In fact “Earth rammed tire-homes have a “negative carbon” footprint,” because their construction removes materials from the planet, such as tires, bottles, and cans, that would otherwise need processing or create pollution. 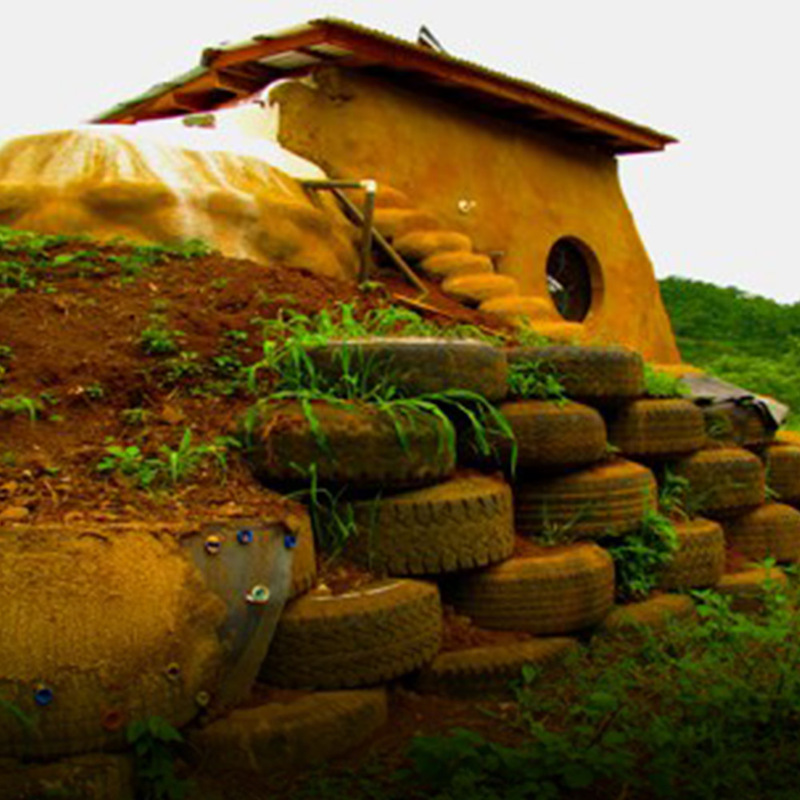 The tire-house, also called an “Earthship” can be a very practical method of building a bermed, passive-solar house, using mostly renewable and free building materials that draw little from the Earth’s energy resources. They are also low maintenance and cost effective to construct and keep at optimal room temperature. “In that the construction method itself provides thermal storage (thick, heavy walls), no thermal mass needs to be imported into the structure to store the heat gained by the solar array of South-facing windows. Another benefit is that the plumbing in this house doesn’t freeze even if outside temperatures fall well below zero degrees. As a result of the large amount of thermal mass in the house, the ambient temperature doesn’t fluctuate as it would in a stick-framed home with no heat. Even with the woodstove going, the inside temperature doesn’t go up but one or two degrees because of the large amount of “stabilized” mass. The thermal mass of the home literally pulls heat out of the air. Then when the air temperature of the room goes below the temperature of the walls, the heat comes out of the walls to keep the room relatively warm and stable.